The picture is looking much brighter for Manchester United now. Wednesday's victory over Olympiakos in the Champions League has lifted the gloom for Manchesre United manager, David Moyes after last Sunday's humiliation at home to Liverpool, although Manchester United will have to be at their best at Upton Park, a ground where they have often come unstuck. The doubts will return if United lose to West Ham, who are not quite clear of the relegation battle just yet. West Ham have lost their past two matches but this is unlikely to be easy for the champions. Adrian; McCartney, Reid, Collins, Damel; Taylor, Noble; Jarvis, Nolan, Downing, Carroll. Substitutes : Jaaskelainen, Spiegel, Tomkins, Armero, Johnson, Razak, Diarra, Diamé, Nocerino, J Cole, C Cole, Vaz Tê. De Gea; Evra, Ferdinand, Jones, Rafael; Carrick, Cleverley; Januzaj, Mata, Rooney; Welbeck. Substitutes : Lindegaard, Giggs, Buttner, Fletcher, Valencia, Kagawa, Nani, Hernández, Fellaini. Injured/unavailable : O'Brien (shoulder), Borriello (hamstring). Injured/unavailable : Evans (calf), Smalling (hamstring), Van Persie (knee). 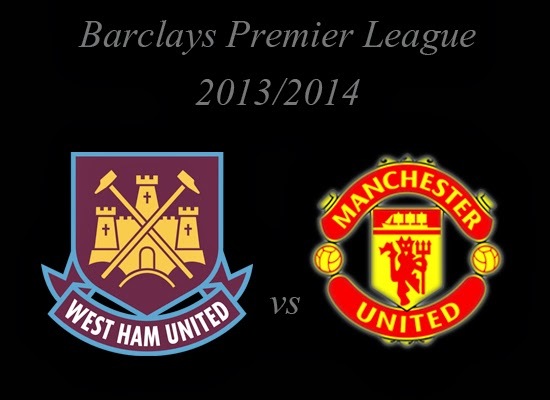 How do you think about Barclays Premier League Match Preview : West Ham United vs Manchester United?